President Trump arrives for the State of the Union Dec. 5. Photo courtesy of the White House. NACo's Matt Chase echoes president's State of the Union remarks: "One of the greatest opportunities for bipartisan action at the federal level is reinvesting in America’s infrastructure"
Passing legislation in the 116th Congress to rebuild the nation’s infrastructure is “not an option, it’s a necessity,” President Trump said Feb. 5 in his State of the Union address before Congress. “Both parties should be able to unite for a great rebuilding of America’s crumbling infrastructure,” he said to applause. County officials across the country were likely cheering that statement as well. 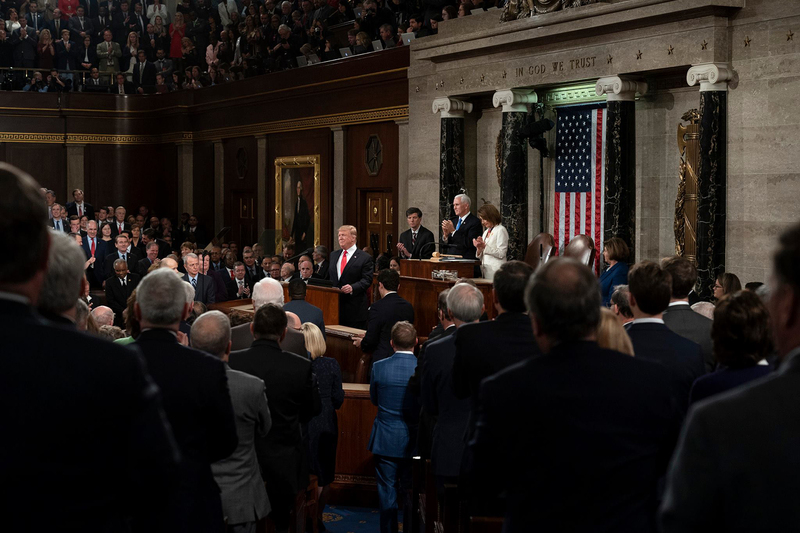 Trump’s speech was delivered before a joint session of Congress and watched by nearly 47 million people on the heels of an unprecedented partial shutdown of the federal government that was not mentioned by the president. “We are on the front lines of serving our communities, providing key services like emergency 911, law enforcement, health, human services, community development, infrastructure and more,” he said. “We need a steadfast federal partner to pursue our shared goals and seize the opportunities ahead.